This book opens a unique doorway into the world of creating. Exploring what it means to be creative from many perspectives, this eBook investigates the act of creation, the processes and inquiries involved, and the results and consequences of creating. It also reveals what stops us from creating effortlessly and easily, both as artists and in our everyday lives. Our Emotional Heritage, An Evolving Entity? Risk..Do We Take a Chance? This book offers you a unique doorway into the world of creating. It explores what it means to be creative, from many perspectives. It investigates the act of creation, the processes and inquiries involved in creating, and the results and consequences of creating. It also reveals what gets in the way of us creating effortlessly and easily, both as artists and in our everyday lives. This book will be helpful for those who work professionally in the creative arts, such as painters, actors and writers; for those who enjoy creative pursuits as a hobby; and also for those who would simply like to enhance their creativity in their daily lives. It will also be transformative for people who consider themselves to be not creative, and who wish that they were. It provides an entry point for anyone who wants to deepen their understanding of what it means to be creative. The fact that the content provided here is presented in the form of a written text might define it as an intellectual exercise or an abstraction of experience. However, my intention is for your experience of reading this book to be more than the mere consideration of ideas. More than simply the gaining of understanding, in the intellectual or cognitive sense. My hope is that what you read becomes “palpable, sensed and felt” within your self. Therefore, the following chapters do not merely present ideas, concepts and arguments. They also present processes that invite the palpable sensing of our experience. As well as reading interesting and original ideas, you will also have the opportunity to do some very interesting and enjoyable movement explorations that will allow you to translate those ideas into direct embodied experiences. These movement explorations can be done at home by yourself, with a friend or in a group. They are all fairly short and easy to follow. They will lead you to a profound understanding of yourself and the patterns you unconsciously use when you strive to be creative. The movement explorations will allow you to directly experience the ideas contained in this book in your own body. It is through the embodiment of our actions, thoughts and feelings that we can alter the way we create and be creative. Through this embodiment, we can change not only how we create in the sense of creating a work of art, but also the ways we create our lives, our relationships and ourselves. Thus, in this book there is a union between the abstract and the concrete. This allows you, the reader, to experience a similar union within yourself, such that your sense of yourself and the world you live in may begin to expand. Your sense of yourself may develop more fully into what you imagine yourself to be. You may even begin to discover a “you” that you cannot yet imagine. It is important that we consider our interaction in this book to be like a conversation. A two-way dialogue between the ideas that are put forth on these pages, and your listening to them, your internal response to them, your assessment of their interest, meaning or value to you. Whilst you do not have the chance to respond directly back to me, as you would in a traditional conversation, nevertheless just this notion of two-way dialogue may shift how you pay attention to what is written here. 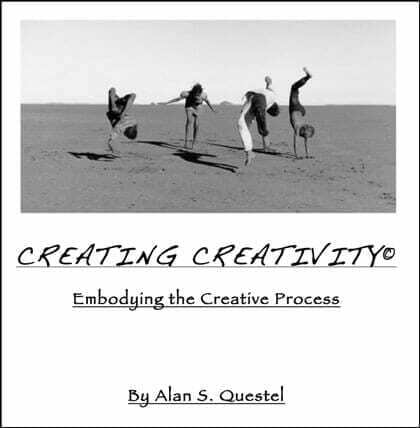 I started out my working life as an actor, but I didn’t conceive of this book on creativity until I undertook and completed my training in the Feldenkrais Method®. The Feldenkrais Method is an experiential learning system that fundamentally rewires how we move, sense, think and feel. It will be explained in more detail below. In 1983 I had just completed my training as a Feldenkrais Practitioner and was teaching and participating in a weeklong workshop on personal growth. During the week, I suddenly had this idea of wedding my two worlds, acting and Feldenkrais. I wrote out chapter titles that night (in August 1983), and every few years I would revisit this yellowed piece of paper, to find that the chapters still made sense to me. As I began to write this book (many years later) I soon came to realize that what I was writing about was part of a world that was much bigger than just acting. It was about being creative. It became my aspiration to investigate the creative process, not just in theory but through our actual experience. I have always been attracted to experiences of all kinds, much more than to academic learning. It is these experiences that I have drawn upon to create this book. I’ve had the good fortune of having great teachers, a few careers and lots of interesting travel experiences that have all contributed to the evolution of my thinking. Whilst my acting training was foundational to this process, it was my training and experience in the Feldenkrais Method that gave me the means to more fully understand and express the ideas I had. What initially drew me to the Feldenkrais Method was lower back pain. However, when I went to see a practitioner, I found the experience to be utterly fascinating. Not only did my back pain completely disappear, almost as if by magic, but I noticed in the ensuing days that my emotional state had altered, and my relationship to the outside world had changed. I became intrigued and decided to study the Method, thinking that I would pursue it part-time, to support my acting career. However, the training was so fascinating and transformative that I have never really returned to my acting career, and to this day I practice as a Feldenkrais Practitioner and travel the world training other Practitioners in this extraordinary method. The Feldenkrais Method was developed by Dr. Moshe Feldenkrais. Born in Russia, Feldenkrais immigrated to Israel at the age of thirteen. After receiving degrees in mechanical and electrical engineering, he earned his D.Sc. in Physics at the Sorbonne in Paris. He subsequently worked for a number of years in the French nuclear research program. Physically active, Feldenkrais played soccer and practiced the martial arts. He studied with Kano Jigoro, the originator of Judo, and in 1936 became one of the first Europeans to earn a black belt in that discipline. A chronic knee injury prompted him to apply his knowledge of physics, body mechanics, neurology, learning theory and psychology to the body and mind. His investigations resulted in the formulation of a unique synthesis of science and aesthetics, known as the Feldenkrais Method. The Feldenkrais Method is a revolutionary approach for improving both physical and mental functioning through the exploration of body movement patterns and the use of attention. It is based on the brain’s innate capacity for learning and the potential for lifelong development and growth. Movement is used as the medium towards understanding our habits and identifying, learning and acquiring alternatives, which promote ease and wellbeing. The applications of the Feldenkrais Method range from reducing pain, improving neurologically-based difficulties and learning disabilities, and increasing mobility, to enhancing performance of professional athletes, dancers, musicians, and actors. The method is based on learning. Not the kind of learning that is based solely on information; rather it involves learning that can lead to a change in action, a change in thinking and feeling. The introduction of new variations through movement awakens curiosity and teaches adaptation for continually altering circumstances. Rather than attempting to learn the “right way” of doing something, or “correcting” or “fixing”, we can explore choices, options, and different ways of using oneself. Thus, one can act more effectively and efficiently depending on the context and the intention in that moment. The Feldenkrais Method utilizes attention in a learning environment that is both safe, easy, and geared towards an appropriate degree of challenge. In this context, one can discover and shift habitual patterns that interfere with functioning. We become our own laboratory for developing understanding and awareness of our daily actions. There are two main modalities of learning in the Feldenkrais Method: Awareness Through Movement® and Functional Integration®. Awareness Through Movement lessons are group sessions. (Awareness Through Movement sequences are the basis for the movement explorations you will experience in this book.) Participants are verbally led through a series of structured movement sequences which utilize attention, perception and imagination. Designed to evoke a more synergistic use of oneself, the lessons establish new patterns of movement. As the lessons progress, participants become more aware of their movement habits, affording new patterns of behavior. There are more than a thousand different lessons, with movements ranging from developmentally-based patterns to innovative configurations. The movements are usually done lying down or sitting, and in a manner that recognizes each participant’s own pace and range of motion. Comfort, ease, and the quality of movement are the main criteria used, enabling the participant to develop their own inner authority. The other modality, Functional Integration, is a one-to-one, hands-on interaction specifically designed to meet the needs of an individual. Practitioners guide students to a new and more varied use of themselves, primarily through the use of their hands. The quality of touch is non-invasive, informative, and interactive in nature. Students usually lie or sit and are comfortably dressed. As with Awareness Through Movement group lessons, these individualized sessions use movement as the means to promote changes in patterns of thinking, sensing, feeling and interacting with others. The Feldenkrais Method aims to improve physical and mental functioning. It is applicable to anyone wanting to enhance the quality of his or her everyday life and activities. People from many different walks of life do Feldenkrais. They report results of increased vitality, enhancement of self-image, better breathing and posture, greater flexibility and range of motion, and reduction of pain. By bringing attention to the process of movement, students feel lighter and more graceful, and have greater ease and effectiveness in turning their intentions into actions. One of Dr. Moshe Feldenkrais’ many talents was his ability to make the abstract concrete. He was able to clearly and effectively take ideas and concepts and put them into the realm of experience. This was one of the many things I learned in my training with him, and it is the source for the movement explorations after each chapter in this book. The movement explorations are all based on Awareness Through Movement sequences, and are designed to give you a direct embodied experience of the concepts covered in the chapter. I encourage you to take the time to go through these movement explorations fully, whether by yourself or with a friend or a group, for it is only by doing them that you will be able to get the true value from this book. You will find that they will not only bring about greater ease and freedom in your body, but will awaken your curiosity, enhance your relationship with yourself and profoundly deepen your ability to be creative. Hopefully your personal experience and embodiment of the ideas contained here will develop, enhance and broaden your sense of yourself as a creative individual, as part of a creative community, within a creative world. Hopefully your personal experience and embodiment of the ideas contained here will develop, enhance and broaden your sense of yourself as a creative individual, as part of a creative community, within a creative world. The chapters in this book are successive approximations of a process that can help to unveil, inspire and evoke your own creativity. That is, each chapter builds on the ones before it, both in its content, its impact and in the possibilities it offers you for learning. As in most books, you may find that some chapters speak more directly to you than others. Nevertheless, I encourage you to keep reading through all of them. The final chapter provides the culmination of many of your experiences from the previous chapters. By going through the whole book in sequence and participating in the movement explorations in each chapter, the ending will bring you to a new beginning. A new beginning that you can make part of your everyday life and carry into every sphere of who you are and who you still would like yourself to be. Ultimately, this book is about beginning. It is about starting. It is about taking action in a realm, any realm, that extends us beyond our concept of the self.